For all your Dental Needs! WHAT ARE “REMOVABLE” AND FIXED DENTAL IMPLANTS? 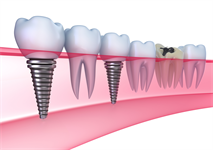 Those seeking dental implants and weighing their treatment options may have encountered such terms as “fixed” or “removable” used alongside dental implants. These terms can create some confusion about the nature of dental implants and the treatment associated with them, so it’s important to define what is meant when use terms like fixed dental implants. A dental implant is not, in and of itself, a replacement tooth. It is rather a small titanium post that is placed in your bone in order to act like the natural root of a tooth. 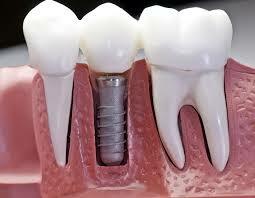 Therefore, dental implants themselves are not meant to be taken in and out of place. They are meant to act as your new, permanent tooth roots. Replacement teeth are then retained by the implants, and it is these artificial sets of teeth (referred to as a “prosthesis”) that can be either removable or fixed. That is, it’s possible to get a prosthesis that can either be cemented permanently to your implants or a prosthesis that can be snapped on and off of your implants. WHY ARE THESE TERMS USED? At our Dental Implant centre, we offer both removable and fixed prostheses for your implants. The fixed option is a prosthesis digitally designed and milled out of zirconia, the hardest material in dentistry that looks like a tooth. These fixed zirconia teeth will not only look like natural teeth, but will also feel and function completely like natural teeth. They can be cleaned exactly like natural teeth: by brushing twice a day with fluoride toothpaste! This is the highest quality option available in dentistry for replacing missing or damaged teeth. The “removable” option we offer is an implant supported denture. The denture is designed to snap on and off of your dental implants. This is a much-preferred alternative to traditional dentures, which have no implants to retain them and require adhesives to be held in place. Traditional dentures will also lead to bone loss, while implant supported dentures have dental implants to stimulate your bone and gums the way that natural tooth roots do. Better still, implant supported dentures don’t require nearly the amount of acrylic over your gums to stay in place, since they rely on implants rather than suction to stay in place. WHY DO WE OFFER BOTH OPTIONS? with dental implants for a firm and secure fit for chewing and speaking while providing healthy bone and gum stimulation to help ensure long-term oral health. Contact our Dental Implant Centre today by calling us during business hours for an appointment. We will help you determine your cost and assess which form implant treatment is right for you after consultation with our doctor personally. This entry was posted in Dental Implants Bangalore and tagged cosmetic dentist bangalore, dental implant, dental implant surgery, dental implants, dental implants bangalore, Dental Implants in HSR Layout, Dental Implants in India, Dental Implants in Koramangala, tooth in a day. Bookmark the permalink.